EnergyPAQ is a self-contained solution which will track, display and store critical power consumption data from multiple power circuits around any plant or facility. Direct 440V is not suitable for UL applications with QE81WH module. Only 4-wire WYE system for direct connection. Not a standard option, contact local representative. 110V, 220V direct connection is possible. Above 440V~6600V voltage transformer (VT) is required. EMU-CTxxx, Current Transformers (CTs) are required for current sensing rated for low voltage (480V system). Current selection – 50, 100, 250, 400, and 600 Amps. Supports wireless option. Wireless electric measurement module is not included. 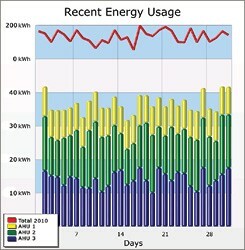 EnergyPAQ uses the QE81WH energy monitoring module. 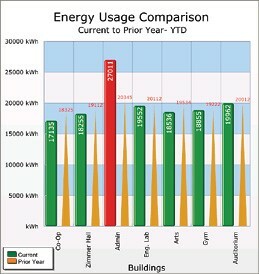 Detailed web-based dashboards show exactly where energy is being used.